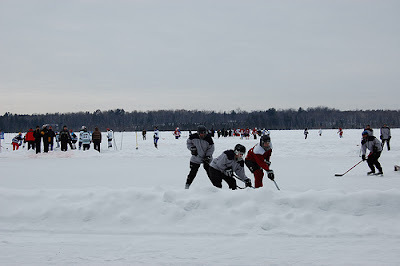 In the winter, Minnesota and Wisconsin hockey fans like to get outside and play hockey on real ice…what we call “pond hockey”. Usually the teams are limited to 4-on-4, that way injuries can be lessened. As you can see, pond hockey is the real thing, playing hockey…no boards to ram your opponent into, or else you could end up on someone elses rink. 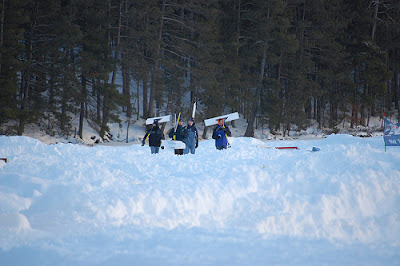 Of course Zambonies cannot go out onto a lake, so clearing the snow away from the pond ice requires man power, and really big shovels. Oh, and you have to get up early, too, before the hockey players get there. 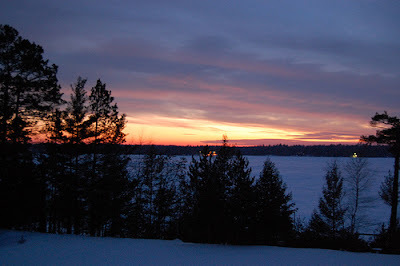 Probably the best part of playing hockey on a lake is you get to see some amazing sunrises and sunsets. Hopefully, you are not playing in below zero temps! Those good old childhood days of playing in the snow and on the ice. Haven’t thought of that in years. Nothing like being the first one out on a snow day to make prints in the snow. There is a crisp clean feeling in the air to a new snow. My favorite thing to do after a snow is to walk outside before anyone else does. If it is snowing in the evening, I like to take a walk…it is very quiet and the snow doesn’t make a sound under your feet.